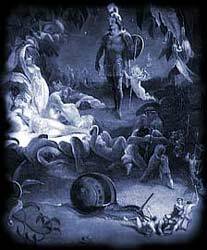 The list of Midsummer Nights Dream characters provide a convenient introduction to the William Shakespeare play summary of Midsummer Nights Dream. The male and female characters bring the plot of the play to life. Not only do we remember the stories but we remember the people - we all have our favourite characters. The following short summary of Midsummer Nights Dream provides a brief description of this famous William Shakespeare play. The story of the plot with its famous characters via the summary of Midsummer Nights Dream. Interesting facts and information about the Globe Theatre of Elizabethan London with a William Shakespeare Play Summary of Midsummer Nights Dream with a list of Characters. This drama is one of the great comedy plays by William Shakespeare. The play revolves around the adventures of four young lovers, a group of amateur actors and their interactions with the fairies who inhabit a moonlit forest. The story takes place in Midsummer and is a complex farce featuring Hermia & Lysander and Helena & Demetrius. Their romantic intrigues are confused and complicated still further by entering the forest where Oberon, the King of the Fairies and his Queen, Titania, preside. Puck (or Robin Goodfellow) is a major character who is full of mischief and tricks. Other visitors to the enchanted forest include Bottom the weaver and his friends Snug, Snout, Quince and Flute the amateur dramatists who want to rehearse their terrible but hilarious version of the play Pyramus and Thisbe. Interesting Facts and information about the Summary of Midsummer Nights Dream and Characters. Additional details, facts and information about the Globe Theatre and the summary and characters of other William Shakespeare plays can be accessed via the Globe Theatre Sitemap.